Coverage of the Hachette-vs-Amazon dispute has recycled various misconceptions about what’s happening, as Michael Cader noted Wednesday in Publishers Lunch. But one of the most widespread fallacies you may hear, and not just relating to Hachette/Amazon, is that “e-books have been more profitable for publishers than print books,” as Evan Hughes put it in Slate. The chunky margins generated by e-books, the thinking goes, are what the publisher and the 600-pound gorilla of bookselling are tussling for. Even before this dispute, some industry voices, led by Mike Shatzkin (echoed by Hughes in the piece just cited, and of course the agent community), have argued that in a sense publishers have been asking for trouble by maintaining such high margins on e-books—like kids walking back from the candy store, their pockets bulging, past the local bully. Shatzkin proposed that publishers raise their royalty rates on e-books so that they could gain some advantage by sharing the “extra” profits with authors before the retailers could zero in on them. Mike’s suggestion was prescient, and there are other good arguments for passing along more e-book revenue to authors (starting with, "they could use the money"). Nonetheless I believe publishers would have been better served by pointing out, long ago, that the notion of e-books as a magical cash cow is wildly misleading. Because the supposedly greater profits from e-books—when published alongside traditional print editions—are an artifact of accounting. The margins that both Amazon and Hachette find in e-books are only as high as they are because of all the resources Hachette devotes to hardcovers and paperbacks. Today in mainstream publishing, e-books are almost invariably published alongside a hardcover or paperback edition. This means the e-book edition floats on top of a huge investment in whatever that title is, which in most houses is not charged against the e-book edition. Furthermore, marketing costs are also charged to the hardcover even when the e-book is published simultaneously. These include promotion (catalogues, advance reading copies, BookExpo displays, etc); advertising; and publicity (review copies and ARCs, author tours). Obviously all these efforts are working to sell the e-book just as much as the print edition. And alongside those expenses are the heinous, eye-watering costs of producing and distributing physical books: Printing, sales commissions, warehousing, shipping, and all the hideous inefficiencies of taking returns. Wait a minute, you’re saying, now you’re going too far. Why should the new, innocent e-book be charged for costs of the bad old dead-tree "legacy" (shudder) business? Because the existence of printed books, the trafficking and display of them, is still a critical marketing tool for e-books! What is the currency of advertising? Impressions. Every physical book you see as you go through your day is an impression, just a like a Coke ad on a bus shelter or a Coach logo on a handbag--each of those glimpses is a little hit of marketing. Think about the millions of printed books out in the world--displayed in store windows, piled on tables, racked at the checkout in supermarkets and drugstores. Or seen in the hands of people on airplanes and buses; given as given as Christmas or Mother's Day presents to people you know. We know that one of the reasons people buy books is that they see other people enjoying them (hence the enduring popularity of bestsellers, even in a long-tail marketplace). There is no question that many of the titles on the e-book bestseller list are boosted by the visible popularity of hardcovers and paperbacks. The thankfully still-robust presence of printed books contributes significantly, I would argue, to the “mindshare” enjoyed by any e-book--not to mention the overall "mindshare" of "book" as a category of entertainment. Perhaps I’m pressing a point if I go from there to arguing that the cost of trucking a new title to a Barnes & Noble distribution center ought to be spread across its e-book edition. But the larger point is that it’s arbitrary at best, and again, misleading, to think we can neatly separate print from e-book costs, when publishing any title is a multi-platform campaign. And it leads to fuzzy thinking about the business if we look at the P&L spreadsheet for a given book and say “wow, the e-book is really profitable” when the poor hardcover is carrying 80 or 90 percent of the investment load. What’s really happening, if you look at this another way, is that the print edition is subsidizing the e-book! 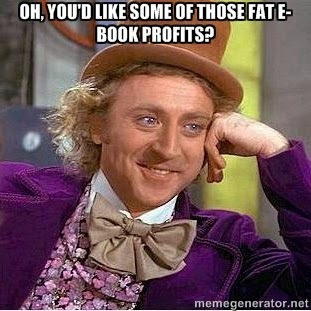 My point here is not to bash the e-book business. It is true that e-books have an enormous economic advantage over print when it comes to manufacturing and distribution, because the incremental unit cost of creating & delivering an e-book is virtually nil. (Even better, no warehousing and no returns.) You need no publishing expertise to see this, and it’s one reason why it seems intuitive to say e-books are more profitable. Some publishers, I’m afraid, have encouraged this misapprehension. Corporate houses in particular like to trumpet the profitability of their digital businesses because it makes them look “innovative” and tech-savvy and gives Wall Street an easily-grasped, upbeat story of a growth driver in the industry. Trade publishing companies have historically thrown off quite modest, not to say anemic, profits and have for decades been caricatured as quaint, retrograde, etc. so maybe we can’t blame them for bragging about better margins that seem to come from new technology. But for all the reasons above, it's wrong to consider the profitability of an e-book edition separately from an accompanying print title. And it makes no sense for publishers to boast of wonderful margins on e-books, unless they are also going to apologize for the lousy margins they get on print titles. Publishers are straining mightily to maintain a healthy publishing ecosystem that includes print and e-books, online selling and brick-and-mortar bookstores. This is not out of nostalgia or an inability to grasp the digital future, but because they understand, as explained above, that print and e-book sales boost each other. And if they give away too much of their revenue from e-books, whether to retailers or to authors, they risk making that multi-format marketplace unsustainable.